BERT KREISCHER is an American stand-up comedian, actor, writer and host who performs to sellout crowds across the country. His standup special BERT KREISCHER: SECRET TIME is currently streaming globally on NETFLIX. Described as having a “rare and incredible talent” (Interrobang), Bert has evolved from being named Rolling Stone’s 1997 "Number One Partier in the Nation" to one of the top names in comedy. Between his two previous stand-up specials, THE MACHINE on Showtime (2016) and COMFORTABLY DUMB on Comedy Central (2009), his two podcasts: “Bertcast,” and “Open Tabs,” his YouTube cooking show: “Something’s Burning,” his book Life of the Party: Stories of a Perpetual Man-Child (2014), along with formerly hosting the Travel Channel’s TRIP FLIP and BERT THE CONQUEROR and FX’s HURT BERT, Bert has succeeded in finding the elusive blend of “being a cringe comedian with real insight” (Interrobang). Lauded as one of the best storytellers of his generation, Bert seamlessly and sincerely shares anecdotes about his family and fatherhood while showing his ability to prove “that there’s a way to take his [party-boy] antics into middle-age,” (Forbes). 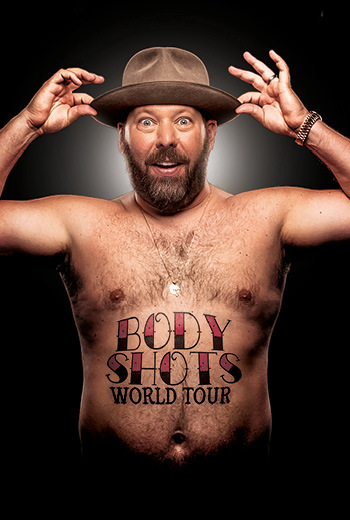 In January 2019, Bert will kick off the BODY SHOTS WORLD TOUR where he will travel across the US and across Europe.